The following headlines in bold are utilized to investigate each art material in the studio. These headlines are the ones that analyze 17 basic art studio medium in The Spirit of Matter e-book. We can now try this “map” with GLITTER and see where it takes us. Keywords: reflections, awe, beauty, fascination, temptation, fun, longing, wealth, hunger. 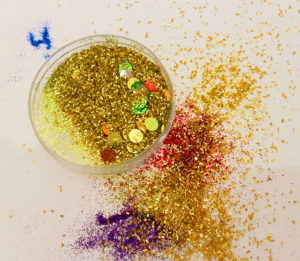 Tiny plastic or polymer-based particles covered with or made of shiny colors. This material comes in small containers or shakers. Therapeutic and Spiritual Significance: Glitter is naturally related to the Western [American] world. It is linked in our memories to social events such as birthdays, happy or supposedly happy life moments. It is connected to industry and sustainability issues. Working with it may convey fascination, reminiscing and/or longing. Emotional hunger might also surface. The reflections and colorfulness somehow ’fill’ the hunger, as they are associated with richness. Many children love to sprinkle glitter on glue. 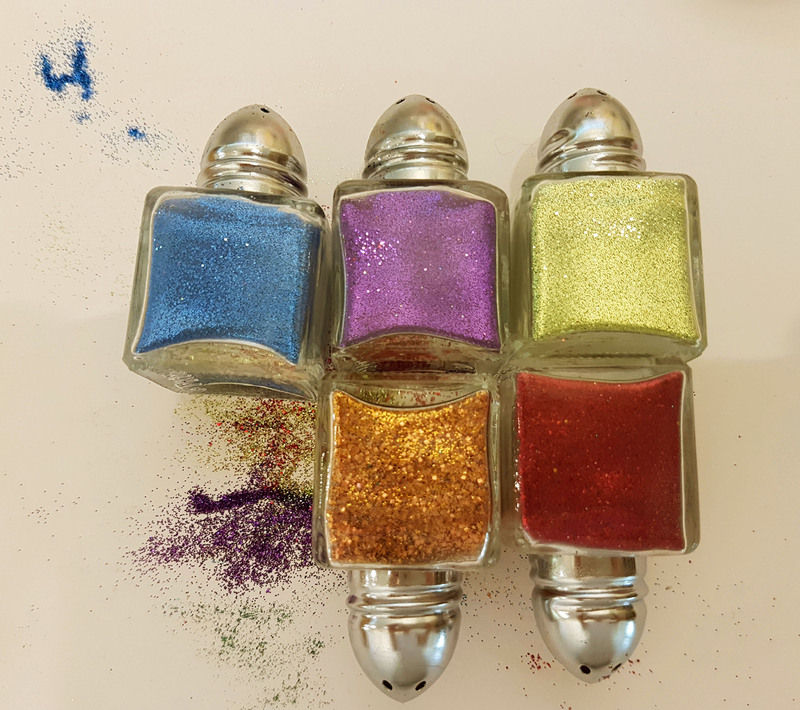 If they plan a shape and “draw” it with the glue – the glitter will stick to it. The issue of wasting as opposed to controlling will be present, as there are always leftovers which present a question in therapy and education as you cannot put them back into the container. Thus, the therapeutic issues that might arise are connected to quantity: how much am I loved? How much will the therapist give me? As for us, it arises from the boundary issue and its meaning with each client. I usually provide cardboard as a surface to ’hold’ the delicate particles. The smaller the holes are, the higher the possibility of control. Sprinkling on cardboard and deciding in advance what to do with the leftovers. Perhaps suggest a special box for that? Sprinkling on cardboard, paper or a sculpture. Covering hands with glue and sprinkles. If you have anything to add or comment – you are most invited! 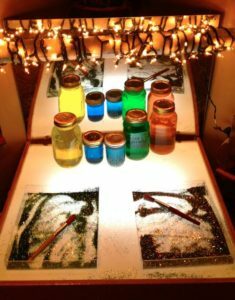 This light table image with a Reggio Emilia influence is taken from here.